On Monday, October 5th, roughly 1,100 audience members were greeted with the wise words of Carlos Santana, courtesy of Dr. Philip Zimbardo. Simple, yet sound advice, no? It is clearly a message Zimbardo took to heart when imparted to him by a powerful source of opposition, more than 40 years ago: his wife. Counted in attendance were community members, professors, social workers, CCHP staff, and UA Board of Trustees members. However, in attendance there were none so important as the hundreds of folks that filled the rest of the room—the students. In addition to our own UA students, several groups made the trek from far and wide, including students from Stow-Munroe Falls, Mayfield, and Hayes high schools; Sinclair Community College; the College of Wooster; Ohio Wesleyan University; The Ohio State University; Tiffin University (featured in picture below); Thiel College; Penn State; University of Pittsburgh; and a host of others. A special “thank you” goes out to Chelsie Polcha and her partner Stephen, who joined us all the way from the University of South Florida—thank you, Chelsie and Stephen! 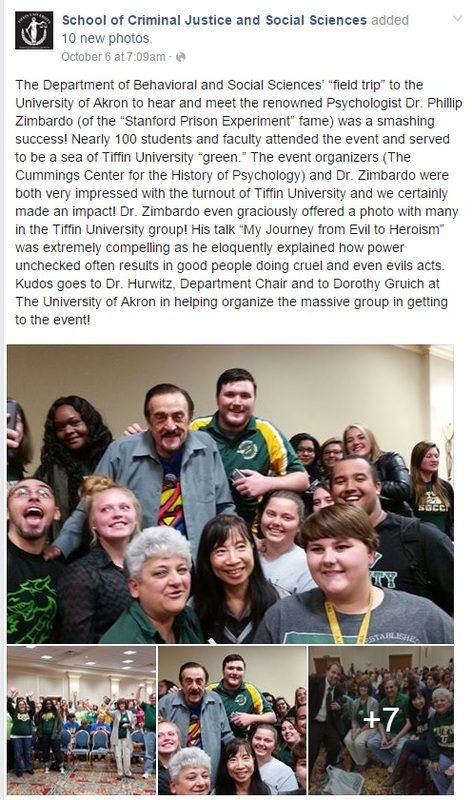 With so many young psychologists-in-the-making and social justice advocates of all generations in attendance, there is little doubt that Dr. Zimbardo’s legacy will be paid forward for generations to come.